The biggest threat to cotton farmers is the bollworm, because of its ability to cause extraordinary damage to crops and livelihoods. In the 1990s, pesticides were the only weapon farmers had against the bollworm. Half of all the pesticide consumption in India was accounted for by just one crop – cotton. Yet, the ability of the bollworm to develop pesticide resistance meant that millions of small cotton farmers in India were being pushed into poverty. The situation changed only after the Indian government, having conducted extensive and stringent bio-safety tests, allowed farmers to switch to using genetically modified (GM) Bt cotton seeds in 2002. Bt cotton contains genes from the naturally-occurring soil bacterium Bacillus thuringiensis (Bt). GM technology is used to introduce the Bt gene into cotton seeds, which then produce a protein that effectively tackles insects like the bollworm. GM technology thus offers the cheapest and most efficient method of protecting the cotton crop from this belligerent pest. Resulting higher yields and lower costs of cultivation have enabled Indian farmers to realise higher profits on their produce over the past decade. It has also averted a potential environmental crisis from excessive pesticide use. The only GM product allowed for commercial cultivation in the country, Bt cotton has made India the largest cotton producer in the world and converted the country from a net importer to a net exporter of this important cash crop. Over 90% of the country’s cotton growing areas today grow Bt cotton, which has resulted in the doubling of cotton yields over the last decade. Bt cotton amply demonstrates that responsible introduction of GM crops can be one of the most potent ways of increasing productivity of crops in this country. Yet, fear mongering by activists over the bio-safety and environmental safety of GM crops has led to a hostile policy regime and resulted in amoratorium on transgenic crop trials. As field trials are the first step towards cultivation of GM crops in India, this ban prevents biotech researchers from introducing indigenously developed GM technologies in the market. This has created a “technological monopoly” for Monsanto’s Bt cotton seeds. Indian seed companies have to pay a licence fee for using Monsanto’s proprietary Bollgard technology that was approved for use in the country over a decade ago. The failure of successive Indian governments to stand up to anti-GMO activists has led to this monopoly-like situation. 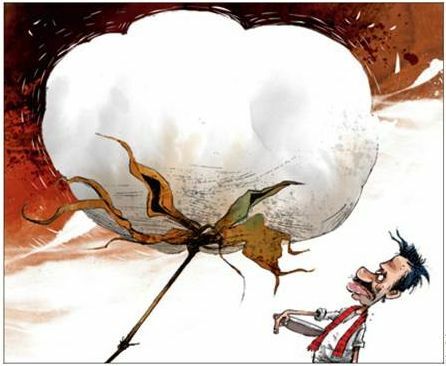 The current government now wants to tackle what it perceives as “high Bt Cotton seed prices” through price controls. To this end, it has recently passed the Cotton Seed Price (Control) Order (CSPCO) 2015 to fix a uniform maximum sale price for Bt Cotton from March 2016. But two wrongs seldom make a right. Price controls will create more market distortions by further dis-incentivising the development of alternative Bt cotton technology. Price controls on cotton seeds through state and central government orders are the latest example of India’s schizophrenic approach to innovation. On one hand we are asking foreign companies to come and ‘innovate in India’, but on the other we have tied the hands of Indian innovators with regulations and prevented them from bringing indigenous technologies to farmers. Advances in agri-biotechnology have led to the development of transgenic varieties of rice, wheat, maize, sorghum, cotton, brinjal, mustard, potato, sugarcane and chickpea. Apart from this, agricultural scientists are leveraging molecular markers in crop breeding for the selective propagation of genes that improve yields and resist disease. Recently, eminent agricultural scientist M S Swaminathan made a strong case against the moratorium and in favour of a smooth approval process towards field trials for GM crops, saying that they are “absolutely essential to assess risks and benefits”. He even suggested that the Indian Council of Agricultural Research (ICAR) should organise an All India Coordinated Project for the field testing of GM crops in the farms of agriculture universities. The government should certainly pay heed to Swaminathan’s suggestion as GM crops not only have the potential to bring succour to millions of needy in this country but also ensure food security for the entire nation. While the government understands the importance of food security, it needs to translate this understanding into action. The constitution of the Biotechnology Regulatory Authority of India (BRAI) as an independent regulatory body is thus critical to the country’s progress in biotechnology. BRAI is proposed as the final authority on issues related to biotechnology with the mandate to take science-based decisions after due discussions and safety trials on GM products. But the BRAI Bill has been hanging fire for several years now because of the hostile public view propagated by a few, on GM crops. This has resulted in a Catch-22 situation. It is of paramount national interest for the government to unshackle agri-biotechnology, which can provide powerful solutions to irrigation and arable land challenges in a country that has only 2.3% of the world’s land area but must ensure food security for 17.5% of the world population. A debt of gratitude is in order for sharing this delightful bit of substance on the web, i'm profoundly obliged and it's my benefit sharing this article on the web. Featured on Forbes Asia's 50 Power Businesswomen List. 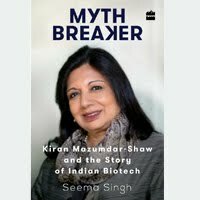 Fierce Biotech, Biotech industry's daily monitor placed Kiran Mazumdar-Shaw among 25 most influential people in Biopharma Business. Featured on the Financial Times ‘Top 50 Women in Business’ list. Featured on the Forbes list of ‘The World’s 100 Most Powerful Women’. Named among TIME magazine’s 100 most influential people in the world.